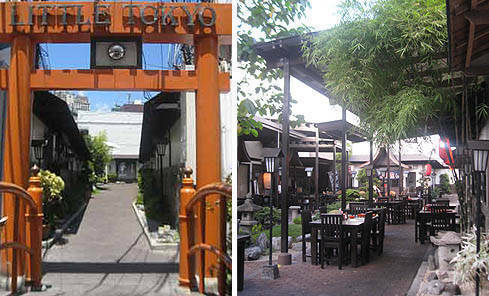 And it is threatening to surround Little Tokyo. Has Colliers been READING this thread? has also evolved now housing a mix of Chinese restaurants, convenience stores, and international coffee "
How long before Colliers starts also calling the area "Little China" ? 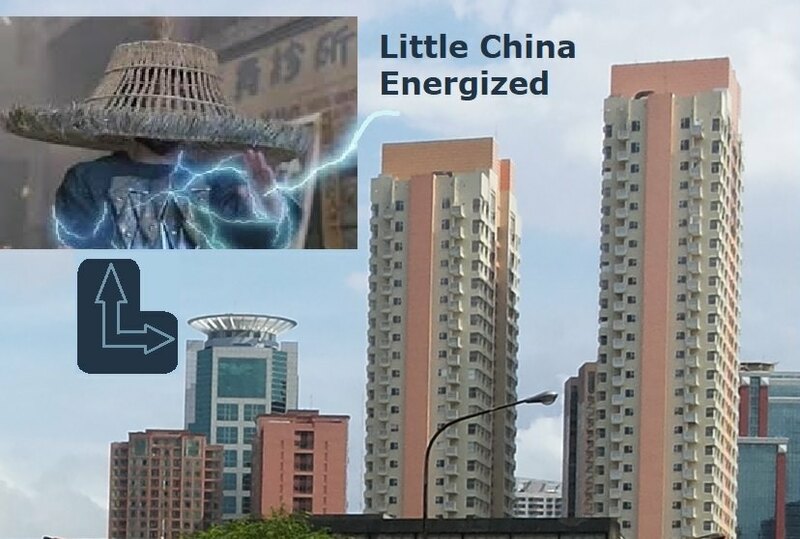 "Colliers recommends that developers with significant ready for occupancy units, especiallin the fringes of established business hubs, to specifically target the Chinese employees of offshore gaming firms. 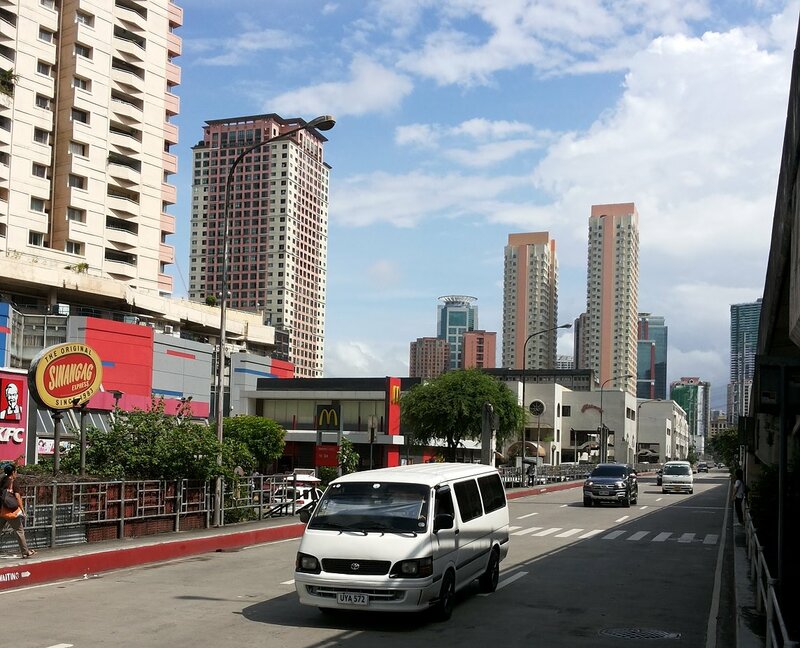 Condominium projects in the Makati fringe are particularly popular among these employees." "Colliers Philippines has been receiving queries from firms based in Japan, Hong Kong and Mainland China planning to tie up with local developers.... local developers can improve their brand image by partnering with prominent foreign brands known for their precision and high architectural and engineering standards." 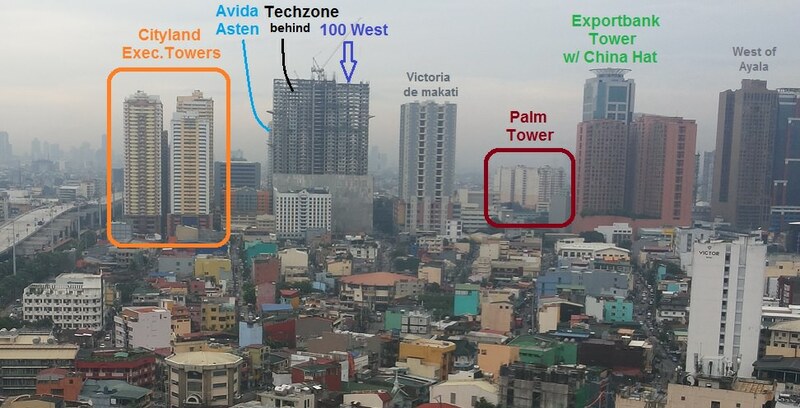 From Left to Right: Makati Square, Oriental Place, Exportbank Plaza Building (between the shorter pair of buildings, Oriental Gardens & Lilac Place), Paseo de Roces Towers. Red Residences will rise next to the PdR buildings. Federal Land has built most of the taller buildings in the area, and has branded them with a memorable pinkish/orange color. Makati Square was been repainted to pick up the same color. 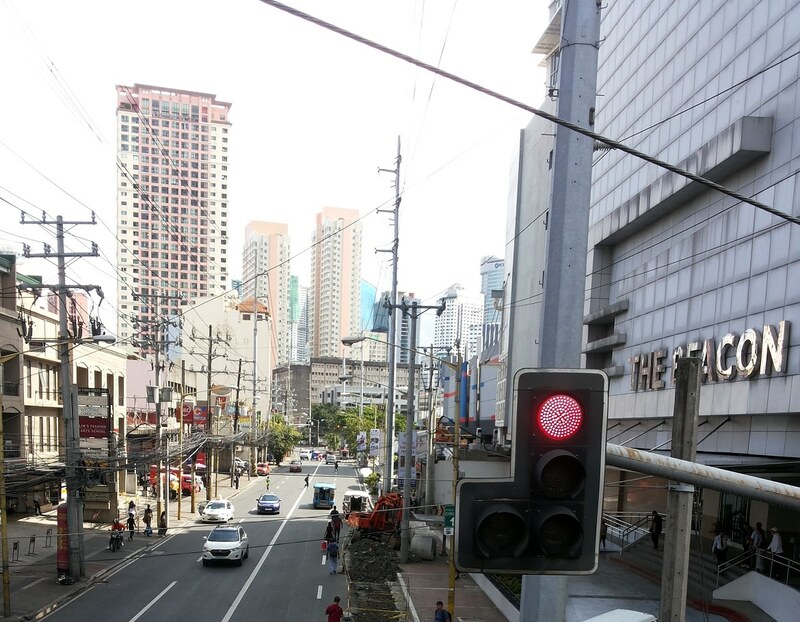 Looking down Chino Roces towards Techzone from next to The Beacon Towers. 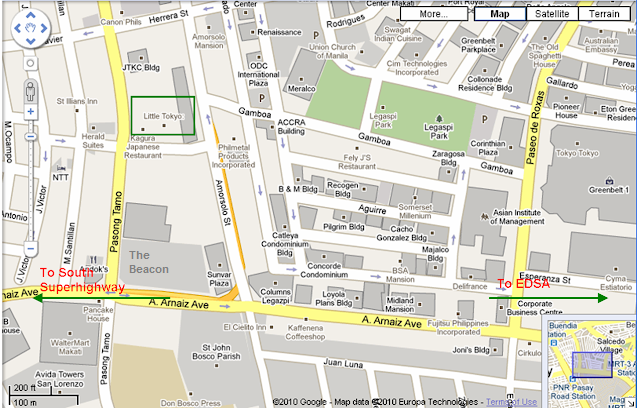 The area immediately next to Beacon has been called Little Tokyo, and I can see these two areas effectively merging. My sense is that something like 1/3 to 1/2 the tenants in Beacon may be Chinese, probably from mainland China, and there are several Chinese restaurants & shops on Beacon's ground floor. 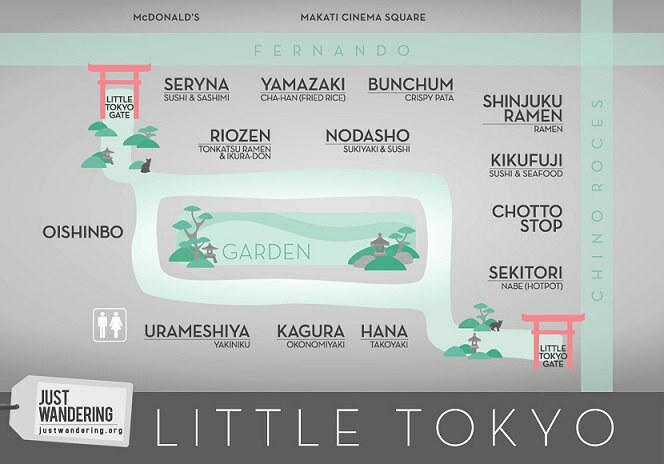 Landmarks around Little Tokyo Makati include the following: Makati Cinema Square, Mile Long, The Gallery, Louie's THX, WalterMart Pasong Tamo, Don Bosco Technical Institute, Amici, Andok's (bigger than usual outlet), Shell Herrera, Skyway Amorsolo Makati Exit, Marvin Plaza, Cityland Pasong Tamo, Wilcon Builders, St. John Bosco Parish Church. 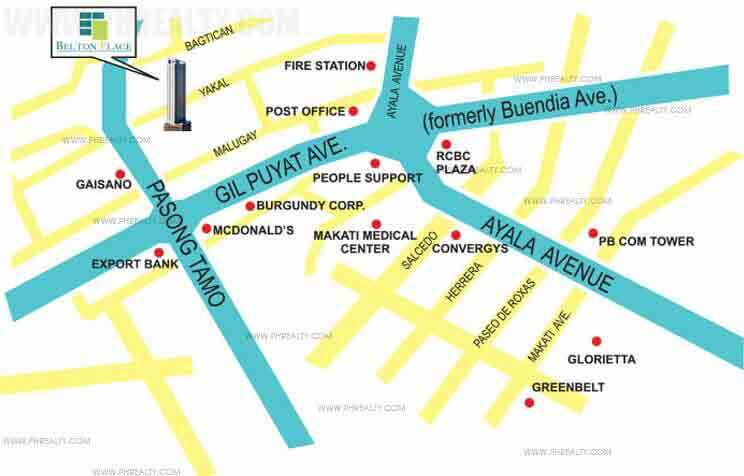 It is also near the Ayala Malls and SM Makati via the Pasay Road (Arnaiz Ave.) - Libertad jeepney route. 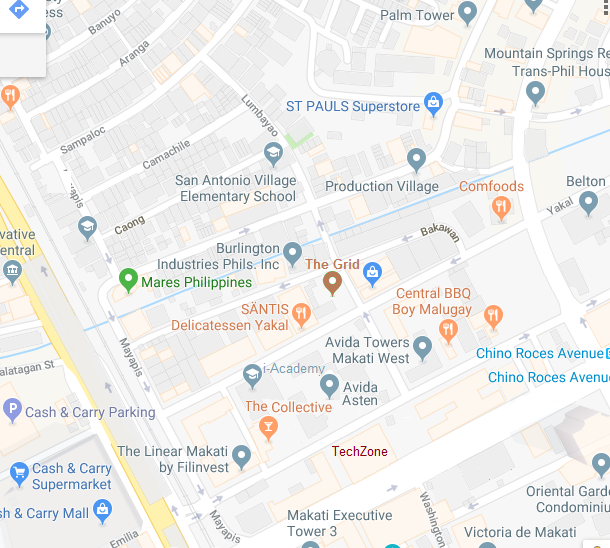 > see thread:Chino Roces / WalterMart to Magallanes - A future Hotspot? Belton Place : now has "70% Chinese Tenants"
A Hong Kong friend told me: "There are Eight (chinese) hotpot restaurants in the area, a short walk from Asten"
China has more billionaires than the U.S. According to Knight Frank, mainland China plus Hong Kong SAR is home to nearly 14,000 individuals worth more than $50 million. High net worth mainland Chinese real estate investors now control an estimated $5.8 trillion of personal wealth, according to CapGemini. Much of it is easily invest-able, and almost half is already offshore. For these buyers, real estate overseas in 2017 was an appealing investment in an uncertain global environment. As with those of lesser means, it also served as an essential underpinning to the creation of an international lifestyle for buyers and their children, whether that lifestyle manifests as a second home, overseas education, or cross border investment portfolio. Recently met up with a property investor from China and below is what he told me (unable to confirm the accuracy). All of Red’s units were sold to a Chinese P2P entrepreneur during launch, average price of ~5.10m for 26sqm 1BR. 40% are perpetual ownership while remaining units are 50 years lease. It seems ~30% bulk sales discount was given to the high average list price of ~265k/sqm. When the P2P guy ran out of money and defaulted, Chinese brokers round up a group of Chinese investors (who have never been to Philippines) to take over the original contracts. The 10+ investors argued in their 5 star hotel as everyone wants to grab more units. The next day, they found they were SMDC’s spare tyre when they found out that another Chinese broker has found a buyer to take over all of Red’s units at ~8m for ~26sqm unit, meaning average price of 300k/sqm!!! This is a ridiculous price. I think they saw that many Chinese are renting at that area (in Oriental Garden, the Beacon...) so they think it will be easy to have the unit for rent, that's why they put this absurd price up. Most of those Chinese are working for online gambling companies. One day there will be a crackdown on those shady businesses and that area will become a ghost town right afterward lol. Expect the place will be crowded with Chinese tenants. With 7M, there are more places with higher standard and bigger size that is worth to live. POGO Paradise, or Oriental Prisons? In August, The Beijing News published a report exposing how Chinese workers lured to the Philippines online gambling scene had their passports confiscated so they could not escape from the country; were crammed into tiny bedrooms; not allowed to have meal breaks of longer than 30 minutes; and were banned from going to the toilet for longer than 10 minutes. The workers described the Pasig City building they worked at – home to numerous online gambling companies and guarded by security personnel with guns – as an “Oriental prison”. Oriental Game – one of the Philippines’ 57 licensed online gambling operators – occupies three floors at the Ecoplaza building in Makati. Four years ago, the company had 200 to 300 staff and occupied just one floor. Now it has about 600 staff, 70 per cent of whom are local. More than 50 per cent of the company’s business currently comes from mainland China, with the rest coming from Thailand, Vietnam, Cambodia, Taiwan, and domestically. According to Monique Cornelio Pronove, chief executive of Manila-based property consultancy firm Pronove Tai, 40 per cent of Makati’s office space is now occupied by online gambling businesses. The figure is 48 per cent in Cebu, 38 per cent in Laguna province and 21 per cent in Cavite province. She described Pogos as the industry’s “unsung heroes”, as they took up a lot of office space last year when there was a slowdown in demand from the information technology and business process management sectors.
. . . Chinese nationals had been able to gain employment in the Philippines without having to apply for these AEPs, the officials said, by arriving on tourist visas and then applying for special work permits intended for short-term assignments. About 119,000 of these special permits were issued from 2015 to 2017, mostly to Chinese working in the online gambling industry.
. . . In April last year, the Chinese embassy in Manila issued a statement warning Chinese nationals against working in the online gambling businesses. The embassy said these workers could be arrested when they returned to mainland China. Here's the thing... If these guys lose their jobs, they are not going to want to go back to China (to be arrested.) Is this a time bomb? Bunchum's: A Little Known Hole In The Wall. Weirdly located in the middle of Little Tokyo, Bunchum's serves typical Filipino food and cheap beer. 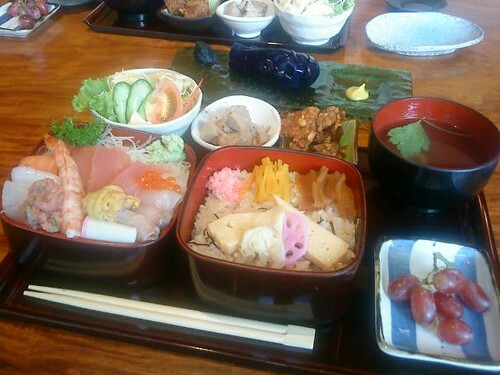 It's not the food you go for, but the awesome ambiance. Quirkily decorated with what seems to really be a personal collection of memorabilia, Bunchum,s is a place in Makati that actually feels truly authentic. And the pork chop's not bad either.